From Make My Workout (MMW), we bring this knowledge sharing endeavor just for YOU. YOU could be a beginner wondering where to start, or YOU could already be working out on a regular basis, but not really seeing results, or YOU could be wanting to do more. Or YOU could be someone who works out outdoors but in this cooler weather you want to shift your focus indoors. You are at the right place. For our professional recommendation book a free trial with us. But for now, how about trying these out? You don’t need fancy equipment for these, and they can be done at home. Go on try them out! This exercise warms up your legs, calves, and abdomen. This exercise warms up your leg muscles, calves, and the muscles in your abdomen. This exercise warms up your legs, back muscles, and abdomen. This exercises your shoulders, arms, and back muscles. This exercises your forearms, arms, shoulders, and latissimus muscles (the muscles at the sides that give your body a V shape). This exercise strengthens your neck muscles. Never do neck rotations. This exercises your arms, chest, shoulders, part of your abdomen, and part of your back muscles. This exercise gives you a good leg and calf warm-up. This also serves as aerobics for your lungs and heart. If you want customized training, all you have to do is give us a call. Look at what our lovely client, Sonali Maniar had to say – “With a few injuries from playing Baddy, I’d not been working out much and was gaining weight. But since I started with Make My Workout, things are getting back on track. The trainer is knowledgeable and knows when to push me and when to go easy on the injured area. He is helping me to strengthen and build stamina. It’s also great that he is always on time. Are you ready to get fit for the new year’s? You have ONE MONTH before that big party! Get started now! Stay tuned to this space for more information! We are very proud of our clientele. 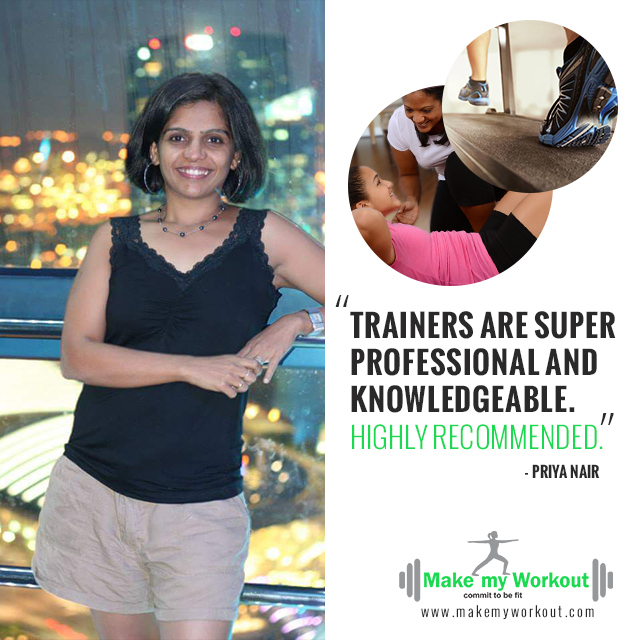 And here’s what our gorgeous Priya Nair had to say! Thank you Priya. You made our day!